Really? Haven't you embarrassed your family enough? You put that silly broken car window golf ball sticker on your minivan, you've got the golf door mat at your front door, and you even have a golf flag flying in your front yard. Do you really want to be strutting around in dorky golf pajamas? Well of course you do! And comfortable they are. BedHead makes all kinds of pajamas, and these will become Dad's favorite -- sorry kids. They are 100% fine cotton and have... ahem.. cute little golf balls on them. The shirt has a breast pocket -- perfect for Dad's cigars -- and the bottoms have a drawstring with elastic in them for a little bit of stretch, in case Dad has a big breakfast. 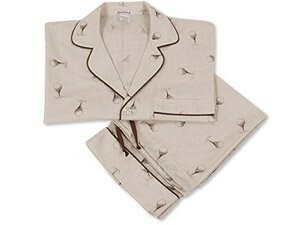 These are cool pajamas, and of course by "cool" I mean really, really dorky. They should be worn only by the serious lounger and ultimate golf geek. In fact, to round out the outfit, make sure Dad has these golf slippers. You guessed it; these are bedroom slippers that look just like golf shoes… Oh dear, your poor, poor family.